LED Crew is a new company that was looking for an economical website that would help get the word out about their company, but not break the bank. 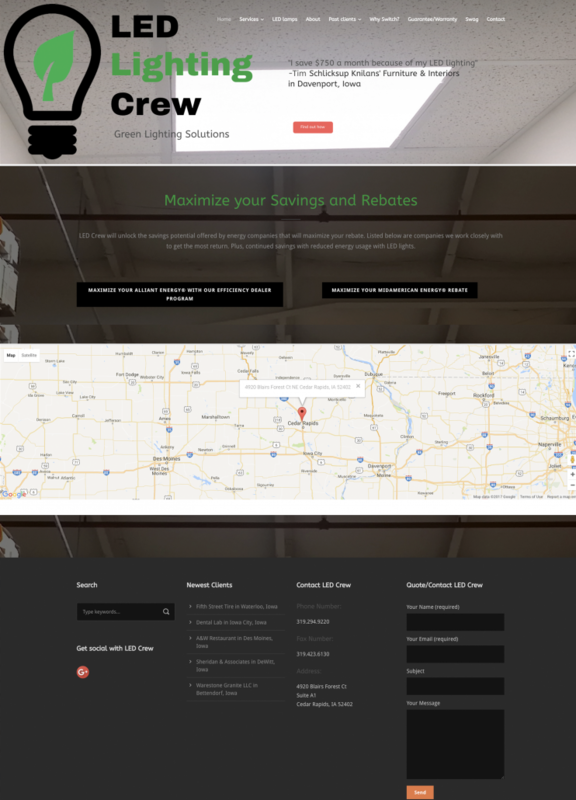 It is an energy efficient lighting replacement service in Iowa that helps you maximize your savings and rebates though local energy companies. It works closely with Alliant Energy and MidAmerican Energy. The owner wasn’t sure if this was going to be a viable business so keeping the cost down, in the beginning, was a major goal of this project. Some of the cost savings strategies we implemented were slower hosting, a non-SSL website and a not fully polished website with minimal photos. We know that most customers convert with quality photos. We didn’t go out to take photos of installers in action. The key is to show a crew member standing on a ladder removing old tube lighting and replacing it with energy efficient LED lights. There is also an explanation on how LED Crew maximizes your rebate by hiring them. Overall, we feel that this website is simply not complete at this stage. We hope we can upgrade it in the near future, and polish it to where this website should be, with captivating photos that potential clients will appreciate. Just because our customer didn’t want to spend a lot of money doesn’t mean that he should receive a website that doesn’t perform well on search engine results. In fact, due to lack of competition in the area this site is top of the industry in Iowa. Once another company jockeys for clients, that is when we would recommend a website update and another marketing measure to make sure it stays dominant in that field.